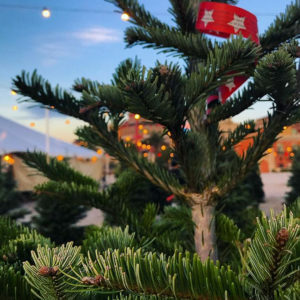 We hand select and tag out trees and take the top 2% of the best quality of Christmas trees in the market.Compared to Large hardware stores take any tree with any shape and condition. Rudolphs Has been in the Christmas tree business for 24 years; with that experience we know where the highest quality trees are in the entire Pacific Northwest and North Carolina, thus providing the customer the best quality tree on the market. Purchasing the tree from the wholesalers is just the beginning of journey to deliver the customer a great Christmas tree. Each of Rudolphs retail locations hand manicure and preserve the trees upon arrival until the customer purchases, therefore the moisture content on Rudolphs Christmas trees is much greater than the trees available at the hardware store.